One of the most crucial decisions your company will make as you attempt to build a business relationship with Latin American partners is your choice of the right person to represent you abroad. After an initial contact by senior management, your company will want to select an individual to act as ‘point person’ to travel abroad and represent your company. Here we have some suggestions to guide that choice and to avoid making mistakes based on misguided expectations. Misconception #1: The representative should have a Hispanic name and background. Reality: A Hispanic name will not garner any favor. Latin Americans are a diverse population, originating from many parts of the world. You will find Hispanics with ethnically diverse backgrounds and names—first and last—that reflect this diversity. So you should not anticipate discrimination or favoritism based on origin. In fact, if you send someone with a Hispanic name to Latin America, you run the risk that your hosts will expect this person to be bilingual—and they may not be! Now, let’s assume that your representative is a bilingual Hispanic. Is his family from the country where you are sending him? If not, the representative may carry preconceptions about the host country, eliminating any cultural advantage. If so, great! Unless the representative bears cultural prejudices that negatively effect potential relationships because of his preconceived notions or attitudes. Misconception #2: The representative should be bilingual—or the other extreme—the representative will be able to perform 100% in English. Reality: Neither of these assumptions is necessarily true. 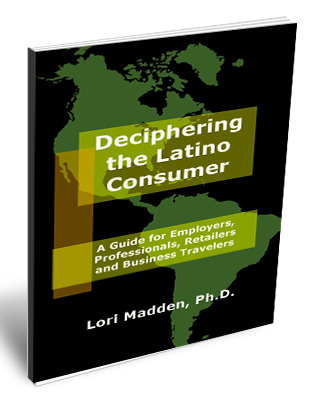 If you send a bilingual Hispanic employee to negotiate with a Latin American company, be sure that she is literate in Spanish. Many U.S. residents who grow up in Spanish-speaking households never study the language formally and do not know how to spell, do not know how to write correctly, and they are incapable of distinguishing between formal language and slang. This would make a very poor impression. The injection of “Spanglish” is another obstacle. Contracts and price quotes are highly sensitive—what if your representative commits to unfavorable contractual terms due to a misinterpretation in language? What if there is an accounting error because she lacks knowledge of the differences in numbering systems or measurements? Verify that she is capable in the language. Or conduct all sensitive business dealings in English with the aid of a competent interpreter, which is the common practice anyway. Spanish (or Portuguese, in Brazil) language skills are not necessary for your representative to have. English is still the language of business and some of your Latin American contacts will be functional in English. However, your representative should develop conversational skills anyway. Attempting to practice even the most rudimentary speaking skills will communicate to your hosts that you value their culture and their friendship. To learn some conversational skills there are many options available: language software, tutoring, college and continuing education classes. The most effective method is to learn some basics at home then schedule some time at a private language institute abroad. These programs are inexpensive and focus on conversation. Some are flexible enough to provide training on a week-to-week basis. Try a school located in the area where your representative will be networking and the school personnel will facilitate a cultural orientation and may even help the representative make connections and resolve issues. To identify a good language school, ask for recommendations or look online and then verify the quality of the school through credible testimonials of former students. Misconception #3: The representative must be highly skilled, knowledgeable and competent in your area of business. Reality: You may be surprised to find that initially, your representative will not be given much opportunity to illustrate his business acumen nor to promote your company when making contacts abroad. First, the Latin American hosts must feel comfortable with your representative and learn to trust this person. More important than degrees, position and mastery of the sales pitch, a good representative must do everything he can to get to know his hosts and slowly build a relationship of trust. The best representative will be a good “people person.” What are the characteristics you should seek? In the U.S. business culture, ambition trumps cooperation. With all the rhetoric we hear about “team building” and collaborative strategies among peers, self interest and aggrandizement instead are rewarded in the business world. Just watch an episode of Donald Trump’s The Apprentice to discover that fighting to defend your own position while throwing the competitor ‘under the bus’ makes you a winner. But this “winning” attitude would only alienate your Latin American prospects. Not only should your ideal representative exhibit cooperation over ambition, but he or she must also be flexible, very patient, and most of all, good with people. The ideal representative should be the type of person who enjoys new experiences, who is a bit adventurous, and who is adaptable to unfamiliar surroundings. She must be willing to accept the foreign culture and learn to adapt to different ways of achieving results. She must be available to travel on successive trips to visit your potential Latin American partners for however long it takes to seal a contract, and beyond. She will act as the point person during the entire process from courting phase, to closing the contract, and then later to offer consistent customer service long after initiating the business relationship. At such time your representative can no longer function in this capacity, she must be willing to introduce her successor to the Latin American partners and work with the replacement until the partners accept him or her as honest and trustworthy. North Americans are always in a hurry. We depend on high-speed computing, ‘just-in-time’ training, multi-tasking, automated payments, convenience stores and fast food. We lead stressful lives full of deadlines. In Latin America, the pace of life is considerably slower. The representative traveling there will need to devote a long time to developing relationships and these relationships are expected to be long-term. Your representative must be personable and genuinely friendly with each member of the Latin American team. He may not be able to predict which team members will be instrumental to his success. This person must be willing and able to put in the time, effort and interest to network and to make return trips before becoming accepted. He must also be willing to handle small favors. He should be prepared to accept special requests throughout this relationship. As he enters friendships with your Latin American prospects, they will likely ask him to provide information, make contacts, or facilitate the purchase and/or delivery of U.S. products they cannot access at home. He should embrace the role of “go-to” guy. They will reciprocate. These favors will be remembered and appreciated. He will have earned their trust. In Latin America, intellectualism is an admirable quality. Your representative will be spending a lot of time with the Latin American team members. Much of the conversation will not be business-focused. Instead, your representative will be engaged with the hosts in social situations. Latin Americans appreciate intellectual dialogue on a broad range of topics. Your best liaison will be prepared to discuss everything from global to local affairs, historical contexts, current trends, sports, the arts, and much more. It’s fine to ask questions of the hosts about politics, religion, gender and all the taboo subjects, as long as the representative does not risk offending his hosts by expressing personal opinions. Your representative doesn’t really have to have a deep understanding of a wide range of topics, as long as he can sustain interest in the free exchange of ideas. Preferences for leisure activities enjoyed by Anglo and Latin American cultures gravitate toward a dichotomy between the private and public spheres. Many of us in the U.S. choose to entertain ourselves with solitary pursuits such as watching television; playing videogames; and enjoying electronic entertainment (consider the popularity of computer solitaire!). We host private parties in our homes, by invitation. We work out with home gyms and bow-flex machines. We shop online. We care about convenience. In Latin America, it’s more about relationships. Leisure is about spending time with other people, often outdoors, at public festivals, at the local (Internet)café, at clubs, exercising with companions at gyms or in sports clubs or shopping at open-air markets. Your representative should be outgoing, a great conversationalist, eager and knowledgeable to speak on a wide variety of topics, and willing to socialize. While visiting the target location, your representative should find a pretense to spend time with her contacts. She may ask to attend the soccer match starring a Latin American team member’s son; ask to join the wife’s gym or morning walking club; schedule tango or samba lessons and go clubbing with her new circle of friends. She may invent a personal project requiring the assistance of her new contacts such as shopping for a special gift from the country for her spouse, children or parents. It will make her visit memorable to them. The idea behind such favors is to engage the hosts, provide an opportunity for interpersonal contact and forge bonds of friendship. 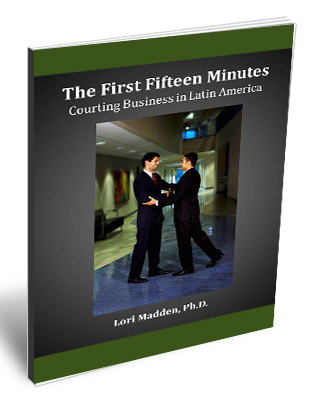 Thomas Becker’s Doing Business in the New Latin America and Morrison and Conaway’s Kiss, Bow, or Shake Hands: Latin America provide cultural tips for conducting business in the countries of Latin America. Copyright © 2010 by Spanish Language Solutions®.